Internet Marketing prosperity is escalating - consumer Internet spending increased in 2005 to $143.2 billion according to ComScore Networks data. To help Internet marketers get their share of this online bonanza, Gunson’s free book Viral Alchemy discloses his VVV™ web traffic formula: The ‘Vital Viral Values’ that can ignite a website traffic explosion. 1. Your idea must have a powerful ‘Pass It On Factor’. This motivates people to pass it along to friends and interested parties. 2. It must be easy to pass along. The idea needs to be easy, even effortless to pass along - such as a link to a video or small file. 3. It must have a high ‘perceived value’ by the receiver such as they learn something absolutely vital to their future, or are made to laugh so that they too are motivated to pass it along. For more information, visit http://www.viralalchemy.com and download Jonathan Gunson’s free book ‘Viral Alchemy’ that reveals his viral website promotion system. The book comes with a free subscription to his newsletter Hit Magic™ which notifies subscribers of the latest website traffic methods. Jonathan Gunson is founder and president of Alchemy Publishing, an Internet marketing company that publishes and distributes information on website promotion and Internet advertising. 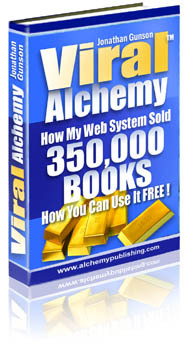 Viral Alchemy Book Cover"Viral Alchemy" reveals the website promotion technique used to attract a million hits to a website, and how almost any website can use this internet marketing technique. Jonathan GunsonJonathan Gunson is the Internet's "Website Traffic Alchemist". He specializes in attracting targeted traffic to websites. 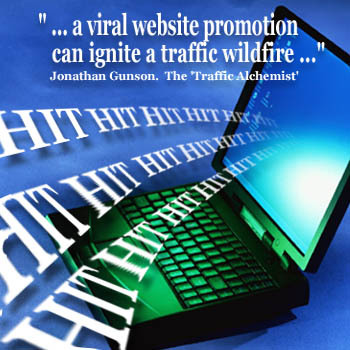 Viral Website Promotion Can Attract Millions of Hits"A viral website promotion can ignite a website traffic wildfire."